This series of 100W Switching Mode Power Supplies with Current Limiting Control, is designed with the objectives of high accuracy, compactness and easy portability. Wire wound potentiometers are used for voltage and current control. 4 digit display LCD of voltage and current for high precision. The slim tower housing makes it ideal for tight work bench. It is light and conveniently portable with a collapsible handle. The large and illuminated LCD display provides clear and sharp readings even under dim light. The output power on off switch allows safe and handy operations. The Tracking OVP (Output Over Voltage Protection) ensures a better and tighter protection to voltage sensitive loads. It has good line and load regulations, high efficiency and low ripple & noise that are typical of advanced switching mode power supply. 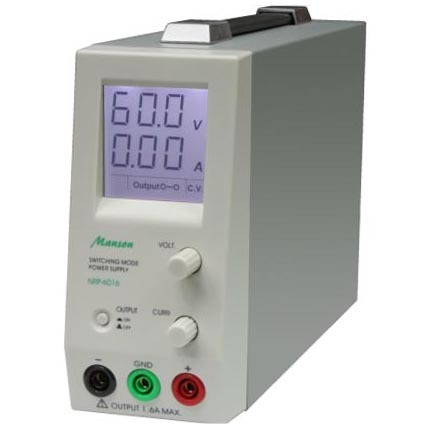 It meets the CE safety standards of EN-61010 for laboratory grade power supply and respective EMC standards. Illuminated LCD indications of A, V, Output On-OFF, CC & CV. Tracking OVP (output over voltage protection), Short circuit, overload and over temperature protections. Ripple & Noise in r.m.s.